Our visit happened on a Saturday. Majority if not all of what was served on us in our function room was the same selection that was available on the buffet spread for the public diners. 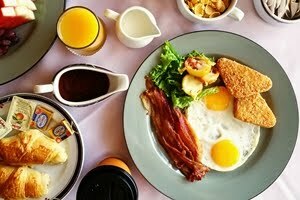 Hence, what I have captured on the video was basically the same dishes that the diners enjoyed that time. 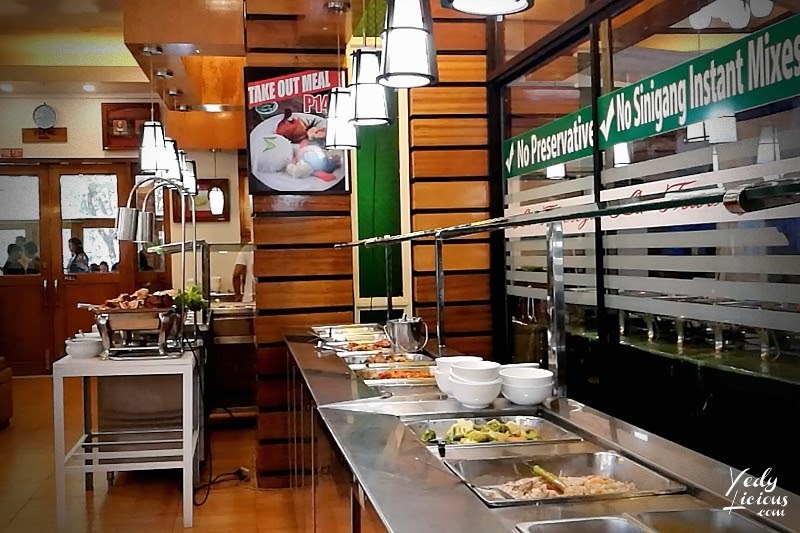 Although it cannot be compared to buffet restaurants in Manila which you can normally read here at YedyLicious, La Travieza Buffet Restaurant offers a decent variety of dishes. As a matter of fact, I have several favorites during our visit. First one was the fish fillet roll in creamy white sauce which flavor and texture I find really impressive. 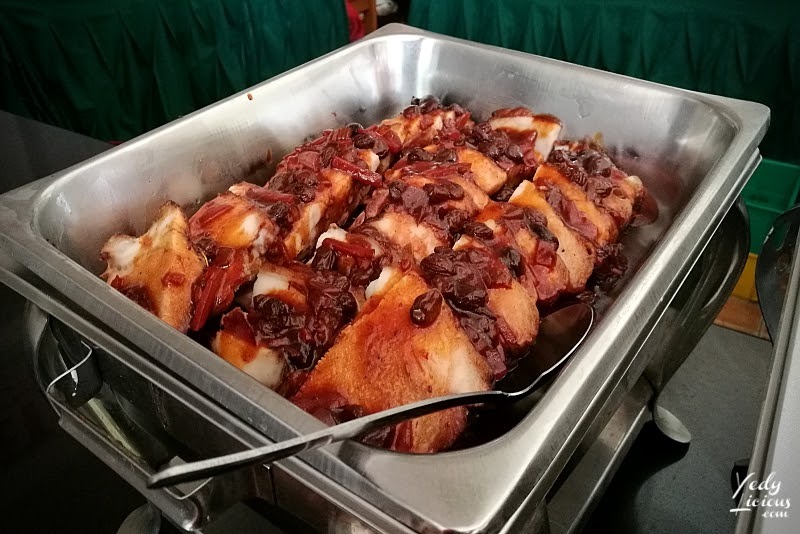 The other one was the sliced pork in savory and sweet raisin sauce which flavor reminds me of Christmas. 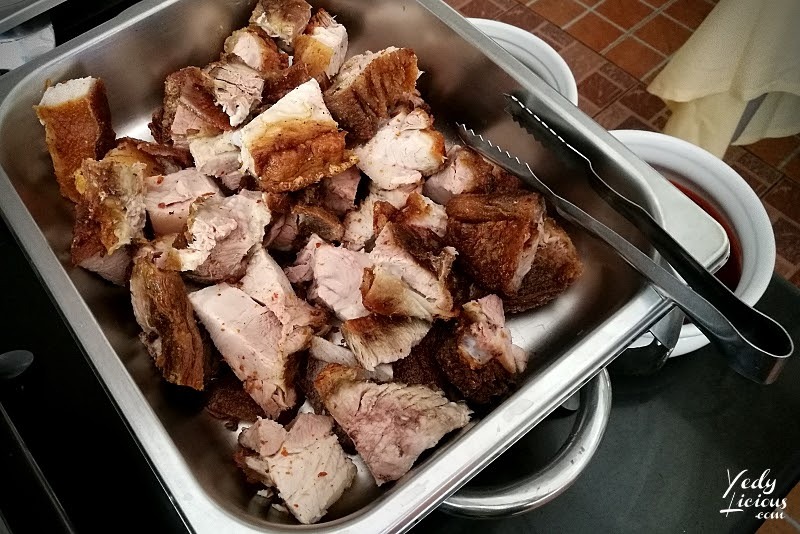 The lechon kawali wasn't that bad either, although, I could have enjoyed it more if the texture was a tad tender. I should have eaten it while it's served hot, my fault for having it sit on my plate a little longer than it should have. I was just overwhelmed with a lot of selections I want to try that day. If you're a long time reader, you know me when it comes to seafood. I love seafood. I co-authored a book about it. 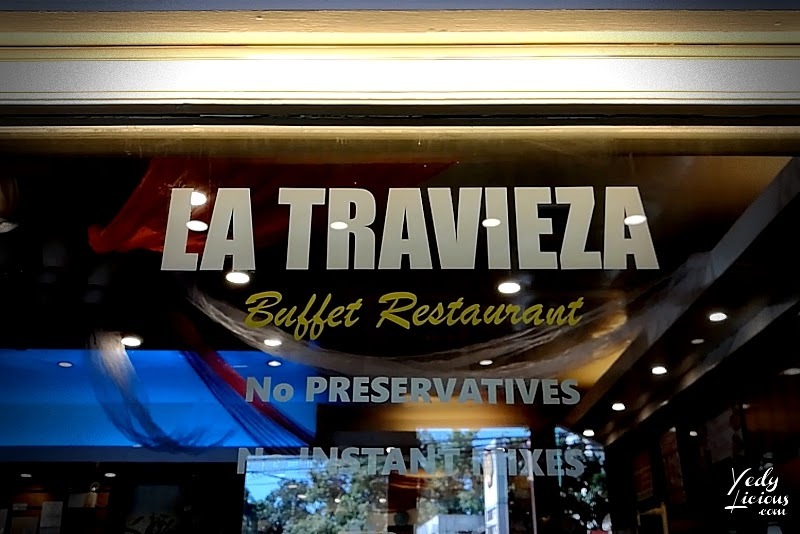 La Travieza, being a former seafood restaurant still has its pride intact for serving decent choices of seafood dishes. 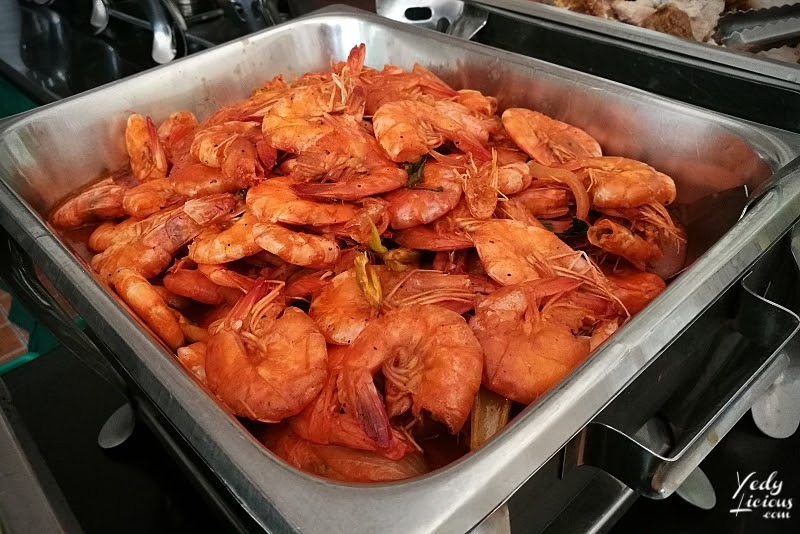 The shrimp dish in particular was one of those which I find popular among the guests and the only dish I had third helpings of. 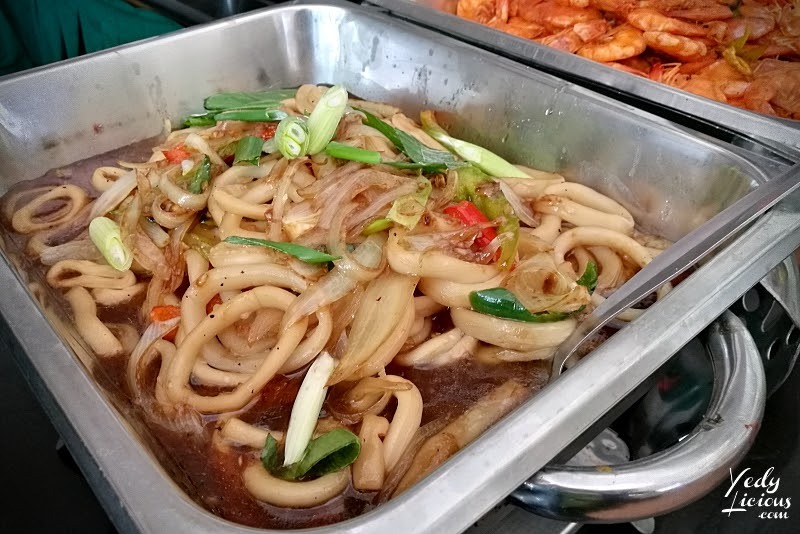 Another seafood dish that I loved was the squid dish. I love that the squid rings are so tender to the bite. The flavor was also impressive - savory, sweet, a tad spicy, and just downright delicious. I had it with steamed white rice but at the back of my mind, I was thinking it can also be a perfect beer-match. 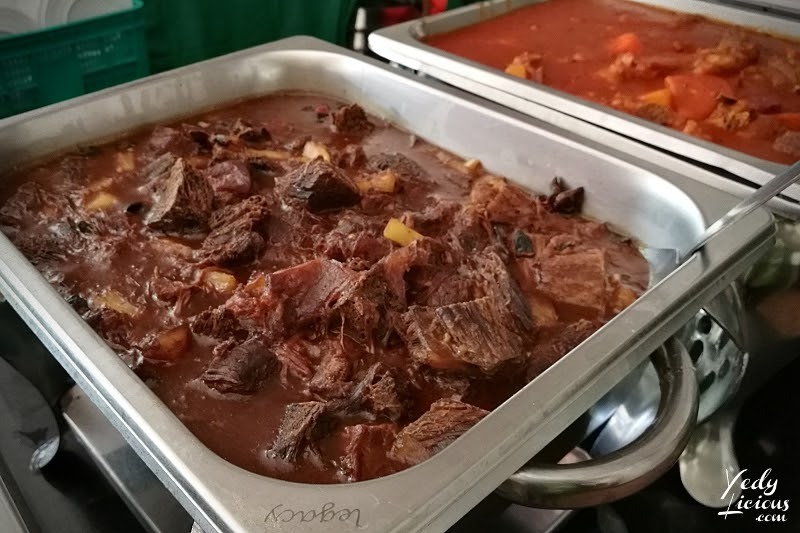 The flavor of the beef stew was also impressive as the chunks of pineapple incorporated to it lend the distinct sweetness to it without overbearingly so. But truth be told, it could have been more tender. I feel really bad that it feels as if it lacks the right timing on the stove because otherwise, it could have been a perfect dish. The crab dish was also great. 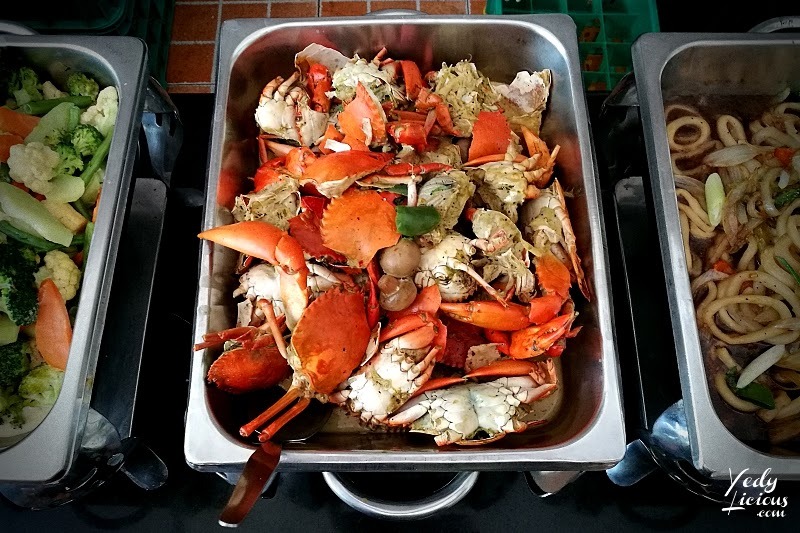 I've been watching way too many Korean shows where people were feasting on crab dishes such as the Ganjang-Gejang so I got a bit excited when I saw a crab on the buffet spread. 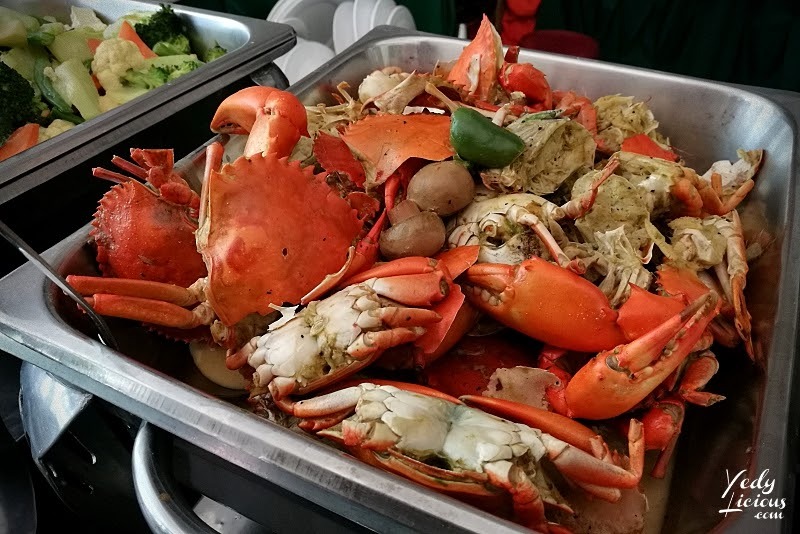 While it is not by any means the same as the Ganjang-Gejang, I was happy that this crab dish at La Travieza was able to satisfy my mean cravings for crab. 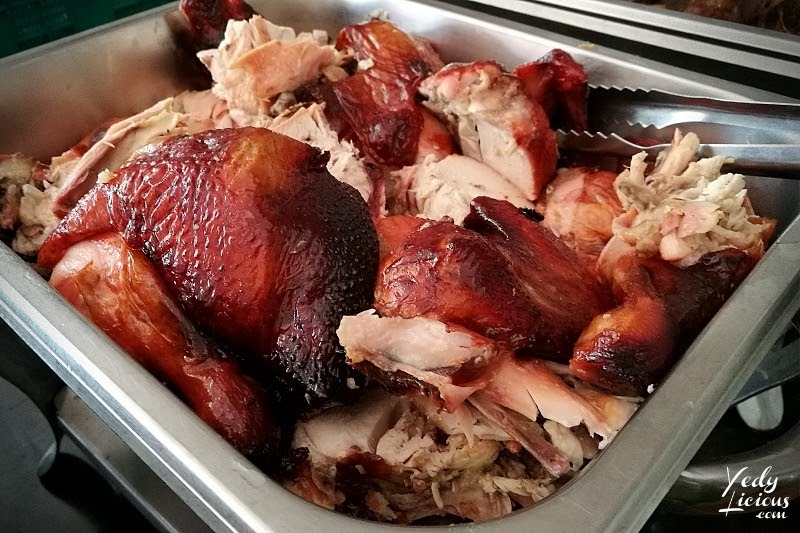 The roasted chicken was also a favorite. The meat was flavorful and the skin was crisp. My two nephews are among those who enjoyed it and had second helpings of it. 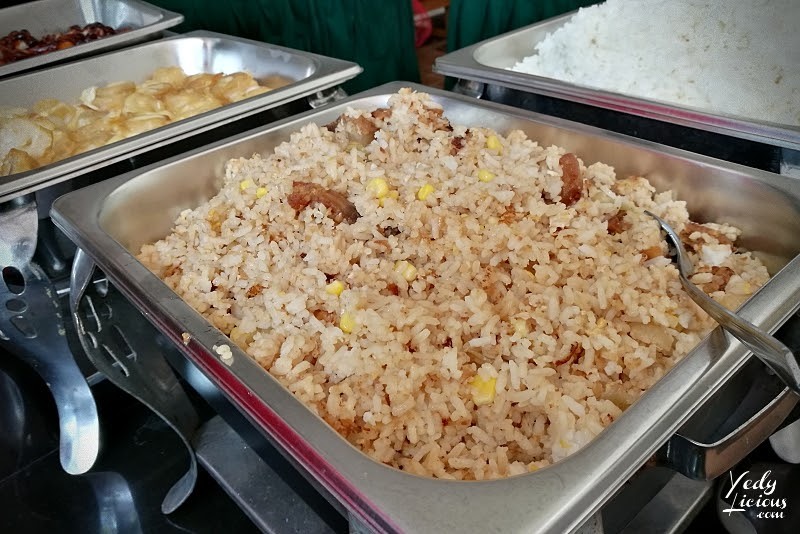 I appreciate that aside from the usual steamed white rice, La Travieza offers another rice option in the form of their own version of yang chow fried rice. It was good, I love the generous bits of pork in the mix which can make it a meal in itself. 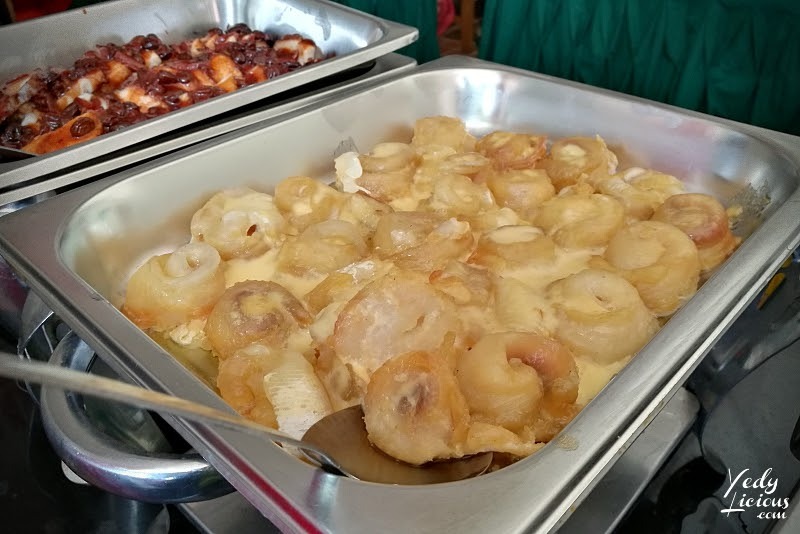 There are several other dishes on the buffet spread like beef caldereta, afritada, among many others. 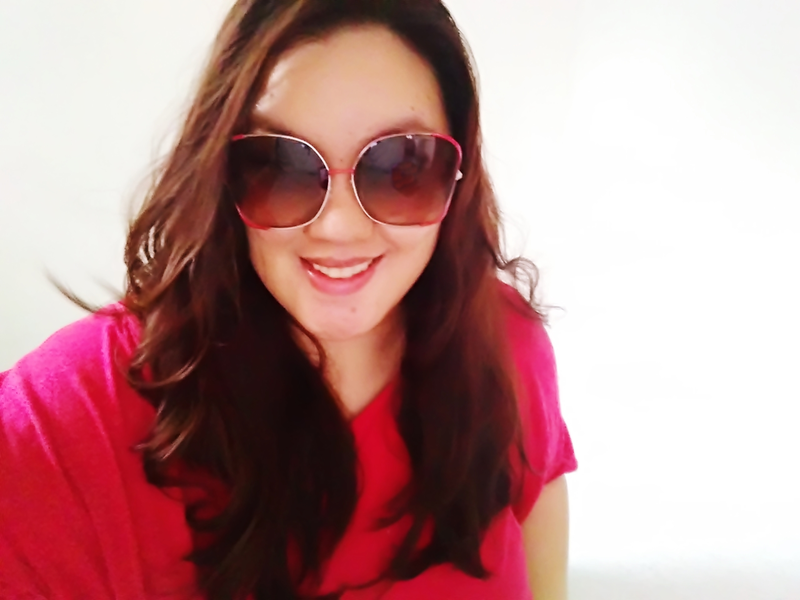 You can see it when you check out the video on my YouTube channel, so be sure to visit YedyLicious TV. 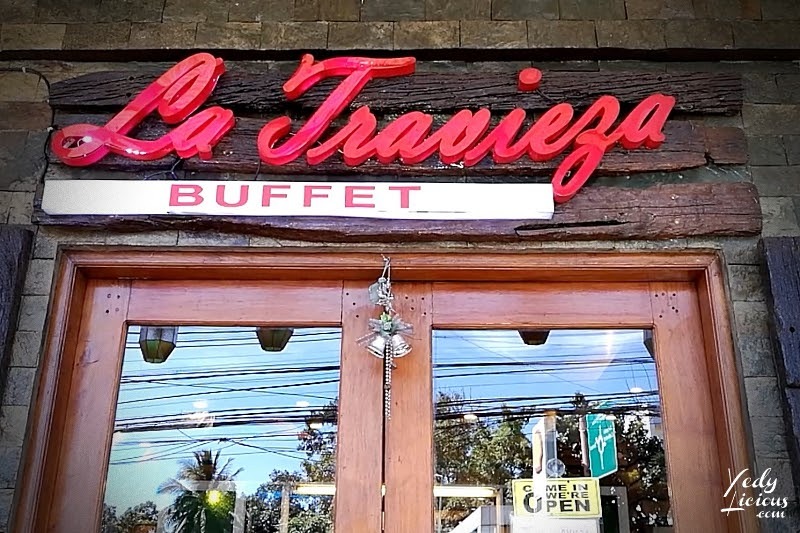 All in all, I find La Travieza Buffet Restaurant in Antipolo City, Rizal a good place to visit if you want to indulge on an eat-all-you-can buffet. 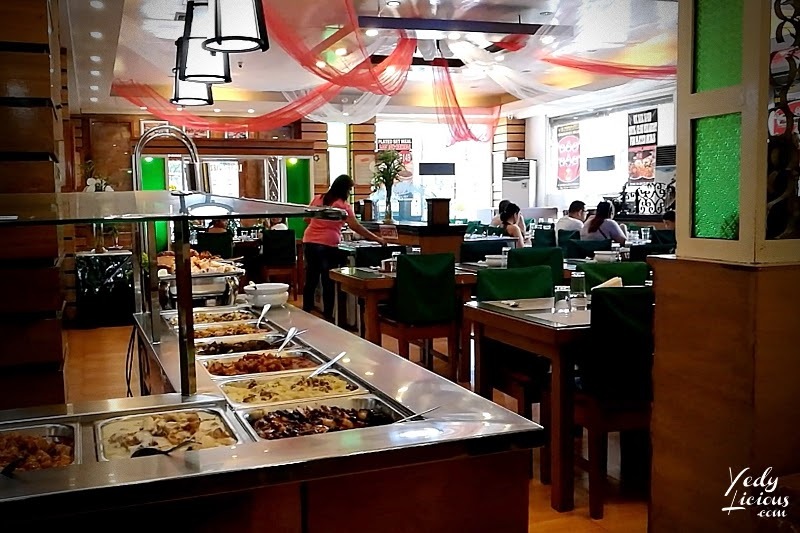 Majority of the dishes are Filipino which makes it a perfect restaurant to visit when you are craving for some or if you are treating a balik-bayan friends or relatives.